Dna 75c - Not any more? There is Vicious Ant Primo if you are willing to spend your fortune Apart from that, I'm stuck with the same problem as yours. Can't figure out why none of the modders use this wonderful chip and make small yet good modes. Did you go for the SL Class? Skar is equipped with the older, non-color dna version. Protovapor's XPV -while still being on a modder's semi-custom made side- might be the only way. However, it doesn't change the fact that major mod companies who are known for using evolv chipsets in their mods do not produce dna75c powered mods any more. Why is that? Hello, I am a happy owner of two dna powered mods, naming a dna 75c and another dna 250c. The dna75c mod is a single battery one which is pretty good for mtl use. As my dna75c mod has close to 200.000 puffs now and started to wear out, I decided to buy a new dna 75c mod. What I noticed is, there are NO serial production mods which comes with Dna 75c anymore. None! There are some squonkers but thats not what I'm looking for. There are one-of-a-kind stabwood etc mods which are super expensive and out of my reach. What happened to major manufacturers such as Lost Vape, Hcigar, Sbody etc. Why don't they make and sell single battery Dna75c devices any more? Will the chip be replaced by an upgrade or something? Any thoughts? Thank you for your appreciation. I will update my themes with replay function as well. @SHALE84 I just completed a set of six plain themes with various color options in english and uploaded them. Enjoy! This is a set of plain themes for DNA 75C boards. Comes with white, turquoise and pink background with black text. It has punch mode with a scale for non-temp sensing materials such as Kanthal. This is a set of plain themes for DNA 75C boards. Comes with black background with white, turquoise and pink text options. It has punch mode with a scale for non-temp sensing materials such as Kanthal. I think that you have resized the battery gauge on the screen. 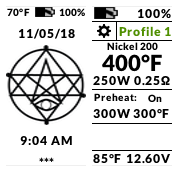 You have to have the exact same dimensions for both the "full" and "empty" battery gauges on the same screen. Correct this and it will be good. Thanx for the comment, will do! Sade sevenler için Türkçe DNA 75C Teması. Siyah arka plan üzeri beyaz ve turkuaz seçenekleri. Kanthal vb. TC modunda kullanılamayan teller için punch (ani ısıtma modu) vardır ve skalalıdır. This is a plain theme in Turkish language. Comes with black background with white or turquoise text options. It has punch mode with a scale for non-temp sensing materials such as Kanthal. Türk arka planlı ve Türkçe DNA 75C Teması. Kanthal vb. TC modunda kullanılamayan teller için punch (ani ısıtma modu) vardır ve skalalıdır. Ne Mutlu Türk'üm Diyene! This is a theme in Turkish language with Turk concept. It has punch mode with a scale for non-temp sensing materials such as Kanthal. 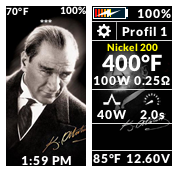 Atatürk arka planlı ve Türkçe DNA 75C Teması. Kanthal vb. TC modunda kullanılamayan teller için punch (ani ısıtma modu) vardır ve skalalıdır. Ne Mutlu Türk'üm Diyene! This is a theme in Turkish language with our father Atatürk. It has punch mode with a scale for non-temp sensing materials such as Kanthal. Kurt konseptli Türkçe DNA 75C Teması. Kanthal vb. TC modunda kullanılamayan teller için punch (ani ısıtma modu) vardır ve skalalıdır. This is a theme in Turkish language with wolf concept. It has punch mode with a scale for non-temp sensing materials such as Kanthal. Türk Bayraklı ve Türkçe DNA 75C Teması. Tema, Therion'un üzerine inşaa edilmiştir. This is a theme in Turkish language with Turkey National Flag concept. It is based on populer Therion 75C theme.